Shop4 All Electrical is a new breed of electrical wholesaler. 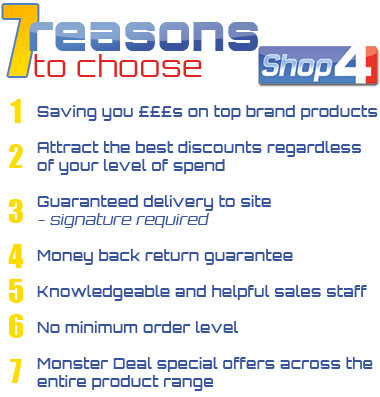 Formed with the simple objective of providing all new and existing customers with branded, quality products at discounted prices not normally offered by your local electrical wholesaler. The lowest prices coupled with the highest levels of customer service ensure Shop4 All Electrical are the obvious choice for all of your electrical product needs. With a choice of over 12,000 products including Cable, Cable Management, Wiring Accessories, Fire, Lamps & Tubes, Lighting, Switchgear and Ventilation you'll find everything you require to get the job done. Our 20,000 sq.ft warehousing holds the huge stocks necessary to fulfil your order. A modern state-of-the art computerised order processing and stock control system enables us to deliver on demand anywhere in the UK. The discounted price you pay is clearly displayed on the website, so there are no surprises at invoice time. You will notice that our prices are heavily discounted away from manufacturer's trade prices - even for the smallest value purchase. You now don't have to spend thousands of pounds to attract the best discounts - WE APPLY THESE DISCOUNTS TO YOUR FIRST AND EVERY SUBSEQUENT ORDER. With no minimum order value, you only need buy what you need - when you need it. Match your spend to your requirements, control your budget and save storage space - all backed by our commitment of guaranteed delivery.